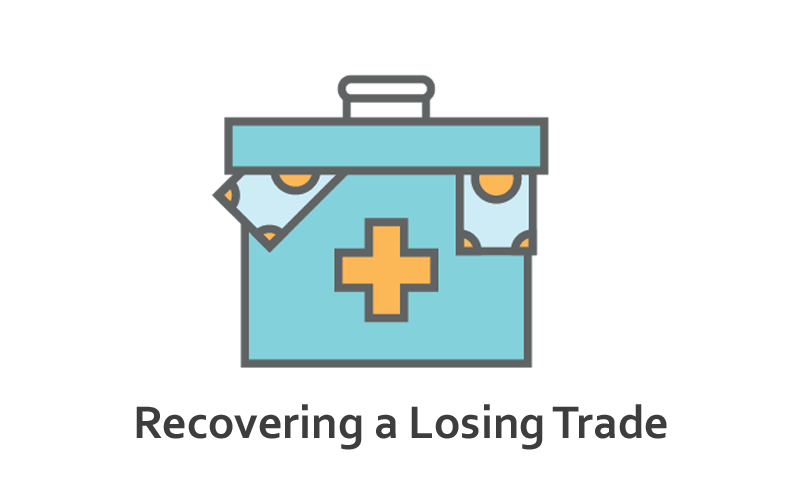 How ever bad a situation may seem, in nearly every case a losing trade can be recovered and even turned into a winner. This is true if you are prepared to take some action and some additional risk. I’ll explain how to do this a bit later. But first, when confronting a losing trade we face three possible choices. Before deciding on one action or the other, it’s worth weighing up each alternative. Of course this will need to be done in light of a) where the market currently stands, b) how big the loss is in proportion to the account capital, and finally c) if there is any emergency reserve capital available. Sitting on a big losing position is stressful and mentally exhausting. In these situations the fight-or-flight response tends to kick-in. The natural tendency is to remove yourself from the threat as soon as possible. That will mean closing out the trade at a loss. In other words run away from it. If the position is big relative to the account size and you have no reserve funds you’ll need to decide very quickly between a wait-and-see approach and closing now. Forex markets do change very quickly. What looked like a low-risk technical trade yesterday can quickly turn into a crisis if the situation is left unmanaged. These are a just a few examples of changing scenarios – the list is nearly limitless. Of course fundamentals can change as well. What’s guaranteed is that the market will always surprise us. A simple test is to ask this question, “would I buy (or sell) now?” If the trade was placed when the market was bullish and it’s now bearish, is it worth betting against that new trend? If the technicals and fundamentals still look ok, you might want to take a wait-and-see approach. But this can only go so far. Remember that every day that the position is open it is also tying up capital with no productive value. When this goes on too long, holding an open position can and often does become counterproductive. How long is too long will of course depend on the strategy being used. A buy and hold trader can afford to sit and wait for a profit because that’s part of their system. On the other hand for a day trader using lower capital and higher leverage it just won’t be viable to wait for a long period of time on every losing trade. The trader who refuses to take losses winds up with many dead positions until eventually there’s no equity left with which to trade. The final choice is to take definite action to recover the loss. 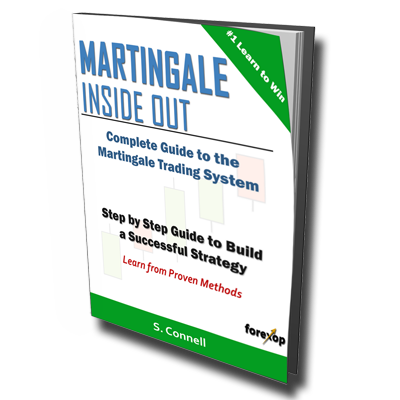 We can do this using a double down recovery system– this means use a Martingale like strategy to force the position into a profit. This will work in nearly every scenario. However it is risky. We’ll cover that that later on. As an outline example, suppose I’ve bought 1 x EURUSD at 1.1500 and the market is now trading at 1.1200. This results in a 300 pips unrealized loss. Now instead of closing and realizing the 300 pip loss, I buy 1 x EURUSD again and this time at 1.200. My total position is now 2 x EURUSD. The loss at this time is still 300 pips. While the loss is the same, the recovery time will now be quicker if the market reverses. This is because I’ve lowered the average entry price to 1.1350. That means an upward move of 150 pips is necessary to break even rather than 300 pips as before. Let’s say that EURUSD is still bearish and falls even lower. This time it drops to 1.1100, a further 100 pips. At this point in time, I double the position again. I now add 2 x EURUSD by buying 2 more lots at 1.1100. My loss stands at 500 pips but my average entry price is now 1.1225. That means should the market retrace back up by 125 pips, I’ll break even. Suppose EURUSD is still bearish but the momentum is falling. It drops this time by 50 pips to 1.1050. Now I double down again buying 4 x EURUSD at 1.1050. The loss is now 700 pips but due to doubling down my averaged entry price is now just 88 pips away from the market at 1.1138. After falling 450 pips from the original trade entry, some retracement is due. Let’s assume EURUSD rebounds back up to 1.1200. That’s a 150 pip retracement or a recovery of 1/3 of the entire fall. My total position now makes a tidy profit of 500 pips due to this small retracement. The table below shows a snapshot of positions as they stand when EURUSD rebounds to 1.1200. If I hadn’t taken recovery action and doubled down, the position would still be in loss by 300 pips at this point. I’d still need the market to retrace back up to 1.1500 just to break even. If I’d doubled down at a more aggressive pace, the recovery would have been even faster. This recovery strategy works because financial markets rarely move in straight lines. Rather they zig zag up and down even when there’s a strong underlying trend. A retracement of 50% of a move must happen quicker than a retracement of 100%. A retracement of 10% must happen sooner than a retracement of 50%. A retracement of 1% is always quicker than a retracement of 10% and so on. The recovery distance becomes smaller and smaller the more times this process is done. This naturally comes at higher risk when dealing with large position sizes. To use this method you simply need to define a fixed distance in pips and a multiplier. Normally the multiplier is 2 but it doesn’t have to be. Then you double the position size (by adding lots) whenever the price moves against the positon by at least the fixed pip distance. Close when there’s a profit or you reach break-even, whichever is required. The choice of these settings will depend on the market. There are various ways to choose these to give the best chance of a rapid recovery. Attempting to recover a position does come with considerable added risks. The risk is that you’ll reach a limit in how far you can go before the market turns in your favor. With the recovery strategy explained above, each increase in position size doubles your risk. But it also halves the recovery distance that the market needs to retrace before returning to profit. So it does mean you will need to have enough reserve equity in your account or be willing to add more. Provided sensible risk management is followed this shouldn’t be a problem because the general rule is that each trade position should be small relative to the account’s capital. The three choices when handling a losing position are recovery, abandonment, or do nothing. Abandoning and waiting are both passive. Recovering the position is nearly always possible but it requires decisive action and a willingness to accept higher risks. Dealing with losing trades is as much a mental battle as it is a financial one. It’s never easy to confront a trade that’s gone bad but the quicker that a decisive action is started, the better the chances of a successful recovery. Not to move stop loss any further than absolutely required is good advice.